blog of yours, I am flying over and whacking you with my 9 iron. Life has been CRAZY-BUSY-WONDERFUL..dearest Mitzi! First, the Best Practices Conference was a smashing success. The 50 volunteers that made up the event were just awesome. They are the best and brightest people I know, and it was an honor to work with them. 1,300 unique avatars attended the event. That means that there are 1,300 people out there interested in MUVE education!!! WOO HOO! That conference was just simply amazing, and meeting new people has been incredible. For example, I FINALLY met CDB Barkely in SL. I have emailed his real-life self, Alan, but never had the chance to meet his avie-dog. Likewise, I met AJ Brooks from Montclair State, and we are working together on a pilot project to connect our resources. KittyGloom Cassady from ISTE is one of the loveliest people I have met, AND she has lived in Pennsylvania and knows what a cheese steak SHOULD look like! Globalkids Bixby is another awesome fellow with tons of energy and passion, and Chuck Hamilton and Holly Stewart from IBM were just a thrill to chat with before and after the conference. Adreanne from Linden Labs was incredibly generous as a communicator for Philip Rosedale. Sheesh Louise, I could rattle names on for a day and a half, and STILL miss people!!! They are ALL just awesome awesome peeps. Some new projects have emerged as a result of this conference, and they all light me up with passion. For example, Hiro Sheridan (SL) started the Open SLedware movement, and this is an important project to me. Opening barriers to education is important in all realities, and I am excited to see this drive for open course content move forward in SL. At the moment, I have secured all new lands and am moving all my properties. It is a crazy thing, but it has to be done (or LCCC needs to give me a raise). Thanks to the absolute generosity of the UK educators group, the British Literature Classroom has moved to Education UK Island. I LITERALLY cried as Eloise and I packed up the two Knightsbridge properties. Debs Regents and the Virtual Commerce Project have been VERY kind to me, but I just couldn't foot the bill without support from LCCC. Eloise, feeling sorry for me, no doubt (blubbering in chat is a heck of a lot more attractive than what it looked like in RL), built Camelot, a Grendel Cave (COMPLETE WITH GRENDEL), and...hear this...HEROT!!! She is hosting the Grand Hall on her property, but we already used it for class. Eloise truly is my Fairy Godmother in SL...no doubt. AJ Brooks and Montclair State University have been kind enough to provide space for Literature Alive! Headquarters, The Garden Classroom for Faculty Development, the American Literature Classroom, and....hear this...a NEW project....the Edgar Allan Poe House!!! As soon as it is finished, we will have a Poe Party!!! Many thanks to AJ for working so diligently to help me. The School Store will be moved in about two weeks over to Drexel Island with the Women's Studies Classroom. Many thanks to Jean-Claude Bradley and Tim Siftar for being so incredibly generous to me, my classes, and the store. While the store doesn't really generate income, it does provide educational tools all in one spot for educators. In real life, I have heard word that my beloved dean, Dr. Jim McCarty, has accepted a position elsewhere. They are luck to have him, and we are the worst for losing him. His support of digital initiaves (especially iTunes and SL) has been fabulous. He will be missed. The Horizon Project wrapped up today, and Vicki Davis, that CoolCat Teacher Wonder Woman, is STILL one of the women I admire most in education. Her passion and light is addicting and infectious. Those kids, from all over the world, did an AWESOME job. I am now involved in an online conference led by George Siemens on the Future of Education out of the University of Manitoba. I look forward to my future in SL as more partnerships form. But, I also look forward to sailing with Adey, going to Phat's JC for some nice music, and horseback riding at my residence in Caledon. Wow! I have not met one....but TWO...Linden creatures! So, I am reading a great book. I used to read before Second Life. This is by Margaret Atwood (tied as my fave author with Gloria Naylor). I like Maggie A because she uses lots and lots of parenthetical phrases (like me, woot woot), and she has curly hair (like me, woot woot), and she is Canadian (which I am not, but I love ice hockey and one of my best friend's is French Canadian...so all that has to count for something). Anywho. I often feel like I am Negotiating with the Dead when I am trying to wake up my son. But, alas, this is the name of her book about A Writer on Writing. So, the first line of the before-you-dig-in-quotes-page-to-see-who-the-REAL-readers-are is a quote from The Agony of Flies by Elias Canetti, "The act of naming is the great and solemn consolation of mankind." Well, now ain't THAT the truth! So, in between rounds of Superman Supercaper Hopscotch (just don't ask), I collapsed in a heap at the picnic table hoping the boys would think big and use their newly purchased implements of digging to scarf up the weeds. I thought about these names, our use of them, and what Branding has to do with education. I am not a Linden (see above). But, if I WERE a Linden, I would pick an easy name to spell like O (for "O Linden come here!"). Poor Claudia...she had to answer soup to nuts kinds of questions. But, because she IS a Linden, everyone thought she had the corner market on answers. And, what, you may ask was her answer? CHECK WITH SLED! Yuppers; even the Linden girl realizes that the BEST resources out there are the educators using it! So, if you are not a member, go sign up (but create an email account just for it). And, if you want to meet with educators in REAL time, come to the conference THIS FRIDAY...it is 24 hours...and it is FREE. Just sign up first so we know to get you a gift bag! I realized again last night that NO ONE knows how to pronounce my name....not even me! I pronounce it Dehzzah dare eeee yah, but Adey pronounces it Dezzzee der ee ya. It matters more to him since he writes poetry and he has to find the time to rhyme it (har). And then I thought for a second that LL should let you change your last name when you partner, but then realized that the rate of divorces in SL is higher than the rate of partnerships, so I scrapped that idea and being a big fan of hyphenation think that the name Desideria Stockton-Maddaloni-Linden quite suits me. But, that is a heckuva lot to type into SLexchange. Desi works just fine, and as a person with a boring name like Beth (which is not short for anything), I have ALWAYS wanted to sign my name with little loopy hearts like the GenX Jenni, Tammi, and Ami girlies that I went to school with back there on the cusp of the digital native movement. My ramblings. What's in a name? Ask the Branding Specialists :-) It is all about a tag, the name, the stuff. The Lindens stay away because the brand there is that they must know more than we do. But, educators, themselves, have a pretty good brand on their own. The Women and War learning community is off to a great start! Dave L is such a pleasure to collaborate with on educational goodies (for a dean and all), and the material is engaging. Dave is teaching WW2 history, and I am teaching Women's Studies. We are using SL as an enhancement tool thanks to Drexel University's donation of land. British Literature is up and running, and it proves to be an exciting class. I can't WAIT for our virtual pilgrimage!!! American Literature is also looking good. Starting in a raw forest, students will carve out a national literature space. We had a great chat about what makes literature national...GOOD STUFF! I know that we all shy away from talking too much about our first lives in Second Life blogs, but I wish to digress for a moment. I want to tell you about a magical guy that I know. As all people do, he has some sad stories in his hope chest. He was a midlife baby to a 45 year old couple, his father was killed tragically when he was 5 because of a drunk driver (in a time when there was no justice for such things), he buried a child who drowned in a public swimming pool, and we worked a life time just to make ends meet. He was laid off in his 50, almost lost his daughter and grandson, was diagnosed with cancer, fought it, and then decided to start a whole new life 25 miles from his former home. To some, they would collapse under a weight of sadness. But, he didn't give up. He just kept on going - taking each day at a time. Over the years, he has earned a few nicknames. All of these names are used to describe a part of a man that is somewhat quiet, hard working, loyal, smart, and kind. He is called Big Fish because he loves to go fishing. It seems a natural sport for someone who likes the stillness of the woods. He taught all of his children to fish and to appreciate and respect nature. He strung worms, removed hooks, and dislodged odd boots from the hooks of children. He signed his cards with a big fish smoking a pipe. He was called Rev at the Bethlehem Steel where he operated a crane high above his co-workers. Stories of his pipe lighter in the black crane filter through to this day, even though he no longer smokes it. But, you can smell the Hickory when you recall the memory. He did a lot of volunteer work for his church, and his peers at the steel called him Rev after he stored pews for the church in his attic. He worked 25 years of swing shift and worked a lot of overtime to provide for his wife and children. He worked hard, but it didn't save him when they closed the steel down. Like many of his friends, he was left to try to find a job in his 50s. In a culture driven by the culture of youth, it wasn't easy. He found a job making fancy chairs at Vitra, Inc. (and, they are REALLY fancy chairs owned by people like Yoko Ono and the like). He took to this job the same passion, dedication, quiet determination, patience, skill, and loyalty as he had in his other jobs. He earned the nickname "Go to Guy" because he helped everyone and anyone. He always thought about solutions; he never let problems bog him down. He didn't spend useless time complaining; he troubleshooted, he acted, he fixed, and he was successful. His bosses and co-workers knew they could count on him; they went to him to help solve problems. He was their Go to Guy. Nicknames are kind of funny. I have had quite a few in my time (some of which don't appeal to me...lol). But, they all do highlight a part of who I am or who I was at a given time in life. For this man, he has always been the Go to Guy. If someone needed help moving, he was there to help. If his children needed rides, he gave them. If his kids needed money to go to the movies, he gave it - even if it was his last 10 dollars. When his kids needed help with Algebra, he helped. If his Aunt needed her pickles opened, he drove across the city and opened them. He shoveled the snow of countless elderly women; he carried groceries for even more. This man, Paul Ritter, Jr., has always been the Go to Guy, but, more importantly, he is my Dad. On Friday, Dad retired from his job at Vitra. They had a wonderful party for him and gave him wise advice like "don't fall in the creek." His forewoman was upset because she was losing her "Go to Guy." It was a hard decision, but it was time. As he approaches this sunset of his life - the close of 50 years working for the profit of others - I couldn't help but think of the song, "The Leader of the Band" by Dan Fogelberg. As my Dad moves on to this new phase of his life, I hope he will remember that his passion for doing a job well done, for being a person that helps others be successful, for taking the time to work carefully, and a person who respects and loves nature has been successfully passed down to me. The stillness of spirit and is one that we share. Dad (I know Peg is gonna make you read this), I know I don't say it often enough, but I love you. I am very proud of the work you have done and of the daughter I have become because of your example. Thank you for being my Go to Guy for the past 34 years. Happy Retirement. Philip Rosedale (AKA Philip Linden) presents this talk. He just seems like a really nice guy. Over the past year, I have had the very good fortune to work with Dr. Jean-Claude Bradley at Drexel University on open notebook science and open access education related projects. For as brilliant a man as he is, he has always been humble and helpful, and his generosity of spirit has allowed me to achieve a great deal. I appreciate his professionalism and his friendship. Most recently, Drexel purchased an island in SL, and Eloise Pasteur shaped it like the Drexel mascot, Mario the Dragon. It is one wicked cool island, I can tell ya. I usually want to pass out at the end of a semester. While I have boundless energy most of the time, I am usually just wiped out by May 1. Since I like to teach in the summer, I don't get much of a break. But, still and all, a nice shooter or two and a nap are good. Graduation at LCCC is quite an event at our college; we run 2 back to back full fledged ceremonies (yup, same speeches, same awards, long long long names for each diploma...ugh). Generally, graduation bores me to tears (thank god for the pockets in those robes - they hold exactly one large bottle of water, two packs of peanut butter crackers, and a worn copy of Frankenstein). While I was happy that the speeches were short, I must say that I was more emotional at this graduation than most. For one, Nada graduated. Nada has been the force behind theater at LCCC for this past year (along with Jeff). While I am officially the faculty advisor to the un-club, I don't actually DO much for the theater. In the past, I directed. But, these last few semesters, I have not had time to do much with directing, and she directed Antigone and Importance of Being Earnest for me. While doing this, she maintained a 4.0 in the Honors program. Plus, she had a heart for the poor and needy of this world. She is just the best student I have ever had at all of the 2 and 4 year colleges I have taught at in the past 10 years. She is incredible woman - humble, intelligent, and kind. She will be terribly missed. Daliah graduated, too. She is a special student because she started over in the middle of life and worked to be successful. She waitied until last to take English because she dreaded it so. I am so proud of her and the work she did for my class and her other classes. And, now, the sunset rests on these students and new students start Monday. Sunset has always been my favorite time of day (how Keatsian of me). To some it means death; to me it means stillness, reflection, and pause. We need the rest so we can start the new day with energy, passion, and excitement. In SL, I hope to celebrate each new day with the Keats of SL, Adrian; my good friends in education (there are just toooooo many of you to list); and my team (Neo, Eloise, Horace, and Foe). Without all of you, this second life would be meaningless. Some super duper exciting stuff is going on inworld, so I have to sit back here for a wee moment and try to absorb it all. First, my buddy at Drexel, Jean-Claude Bradley, bought an island on behalf of Drexel's library and the College of Arts and Sciences. Eloise Pasteur, goddess of SL building and scripting, shaped the island like their mascot, Mario the Dragon, and had it done in like 7.6 minutes (or so it seemed to me). We a re all standing on the new island in that picture above. JC had a wee bit of a makeover (FINALLY)...he went from this, um, avatar to that cool cat pictured above. Second, the Best Practices Conference is shaping up very well. IBM has signed on to sponsor speakers, we have over 250 confirmed attendees, and about 30 presentations (and the due date hasn't even arrived!). Third, I am totally excited about my students coming inworld on May 14th. These courses are open to at-large participants, as well, so if you i nterested in learning about literature, please stop in for discussions! I am overwhelemed by the speed of progress in SL. Moreso, I am impressed and captivated by the educational community. The American Literature Classroom has been rebuilt (many thanks to Eloise Pasteur for her faithful service). classrooms in 3D. Corporate classrooms. Corporate culture. I started to hum Pink Floyd's, "Tear Down the Wall" tune. I started to get itchy. I was starting to need virtual Everywhere I look, the classrooms look like RLbenadryl. My alternate reality simply can not be like my reality. So, I tore it all down. The picture above is the new classroom. It is an overgrown forest because the theme of the course is "Creating a National Literature." To create it, the real people had to start in wilderness; to understand it...students have to return. They will shape this forest as we shaped this culture. I am very thankful to the participants today; they helped me see how this teaching environment will work. It wasn't easy, and I wouldn't help them. But they sorted through the mud and got the point. Shaping something out of nothing and finding hidden treasure in the unkown is hard...but we value that which we work hardest to achieve. They must have hired some elves at Linden Lab. Don't get me wrong; I am not one of the Linden Lab chronic complainers. I don't complain about lag because I understand the physics that underpin the world (a new UUID for every single prim...my hair, alone, is 300 prim). It is amazing that the grid is EVER stable. The little elves at SL have been working feverishly on GOOD stuff!. First, they are beta testing an age verification system. WOO WOO! Second, they are cracking down on the terrible events calendar in SL. Third, they have developed a sculptie prim, but, as I know nothing about building, I couldn't tell ya what that means. It sounds cute. People work REALLY hard to make SL a good place. Obviously, Linden Labs folks are hard at work. But, inworld, I see the educators working frantically to make SL a good place for their students. Eloise Pasteur has been named the official fairy godmother of Literature Alive! We all know her work from those handy-dandy educational products she makes. But, she is also known inworld for her building and scripting talents. She has donated much of her free time to realize a dream that is only half formed in my own mind, and I owe her more than any amount of Linden could pay. You will notice that the American Literature classroom has changed. It had to. I couldn't build one more traditional building in SL; it isn't my nature. I came to SL to break the bonds that I feel IRL, and, yet, I felt that I was simply duplicating what I have in real life. Eloise helped me hash out a kernel that was knocking about my skull, and the new American Literature Classroom (in progress) is pictured above. Students will - literally and figuratively - extract a national literature from a raw land. I am impacted by music in the same ways as literature. I feel it in the core of my soul, and it extends like a web. Please stop in at the Good Samaritan Convention in Joysco and donate to the Literature Alive! exhibit; all proceeds will be donated to Virginia Tech's Memorial Fund. Racism lives in the u.s.a. I love this song. Now, I might be biased because I am a Cougar-Mellencamp fan, and I may be biased because I hear him sing this after the 911 attack on NYC. But, I hear it in the same tone as I read in the writing of Ralph Waldo Emerson, and both writers make me think about change. Change begins with us. Emerson opened "Self Reliance" with a Latin phrase that I adore, "Ne te quaesiveris extra." English professors around the globe will champion the spirit of Emerson in the delivery of lines like "there is a time in every man's education when he arrives at the conviction that envy is ignorance; that imitation is suicide..." and "society everywhere is in conspiracy against the manhood of every one of its members." English faculty praise this spirit; they applaud his independence...well, until Emerson's followers show up at a faculty meeting in 2007. It is Super Hero season in the Guth house. Ok, it ALWAYS super hero season around here. They range from Super Grover to Spidey, and, well, every day is about truth, justice, and flying around the living room with paper towels stuffed in the underpants in lieu of a proper cape. In any event, I get to watch Spider-man A LOT. The best quote, as we all know, is declared by Uncle Ben; "with great power comes great responsibility." In the past few weeks, I have done a lot of tours inworld and via Skype for faculty members, administrative Deans, college presidents, and just regular teachers landing in SL for the first time. In those tours, I try to address the criticism head on - since I am a converted critic, this is an easy task. One criticism pops out a lot, and it is one that I don't have a good answer to yet. Is SL adding to the course content, or is it replacing course content? The answer is....duh...it is an ENHANCEMENT (sheesh, who let THAT guy in the meeting?). But, is that REALLY the case? Teaching English can be very rewarding (someone ought to remind me of that when I am knee deep in comma splices), but it is also challenging. Sometimes I simply can't get my students to give a rat's banana about Mary Wollstonecraft (they tend to love her daughter until they find out that Frankenstein is the doctor's name and she inadvertently forgot to name the monster - a point that their professor seems to find fascinating, and, jeeeez louise, who let THAT woman in the room???). 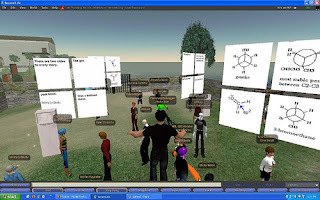 Teaching English in Second Life will help breathe life into some of these characters. Who can pass up the opportunity to go on a pilgrimage dressed as their fave Chaucer rendition? In blowing dust off these poets, I can (hopefully) infuse some of my passion into the chronically apathetic students. But will Second Life technology get in the way? I have attended several presentations by students in various disciplines. I needed to know if the technology was squishing the course objectives. Seeing as the course objectives weren't handy at the time, I couldn't assess (nor did I want to try) the teaching or leadership of my colleagues. But, in a general sense, I can say that most of the presentations asked students to focus on the technology and not necessarily the content. I thought of the prophetic words of my English Grandma; "what is a pretty dish with nothing in it?" This confirms the boos of the nay saying crowd. This needs to be addressed as a community. It is great to have students build great stuff. If you teach 3D design, this is a great tool. I can also see how building and scripting might lend itself to a business course or architecture courses or any number of courses. But, somewhere in there, SOMEWHERE, there has to be the old fashioned and traditional course content...right? I think about Chaucer. We are planning this pilgrimage. But, the students will HAVE to read the tales to be able to PORTRAY a character and then to GUESS which avatar is representing which character. So the text is tied directly to the activity. If I asked my students to plan the event, build the walkway, and script the tavern, that wouldn't teach them a single thing about the tales, would it? If I had them design the Wife of Bath's outfit, would that be complimenting the text? Is it enough of a compliment to the text? Is it enough for a college level British Literature course? Justifications can be made, probably, for either side. I am going to stab myself right in the toe before inserting it in my mouth here, but the best practices in actual content delivery come from the sciences. The Gene Pool and the Blue Obelisk Graveyard game are content driven. I haven't seen a lot in the humanities, but Caledon has the best exhibits (no doubt a testimony to their incredible librarian, JJ Drinkwater). The content is rich; the information is well cited. But, again, those aren't teacher/student activities. In one of the tours this week, someone pointed out they they saw all the teachers but didn't see any students. I wanted to hand him my guitar for a rousing rendition of Where Have All the Students Gone...but figured someone would eject me. I don't know where the students are...I only know a handful of people brave enough to get students in there (Sarah Robbins and Bryan Carter). Everyone else is either "planning to do it soon" or "thinking about ways to do it." Really; in the words of Nike, "Just Do it" (or is that the drug slogan....no wait, that was Just Say No...ok...brain on overload...sheesh). So, back to the Tao of Spider-man. People are watching us. Critics are smugly safe in their desk chairs (or if they are faculty, they are doing shooters of tequila to celebrate the last of exams...unless they work at quarter-colleges...to which I offer my sincere sympathy and a copy of the Chronicle). The SLeducation community has great power. We have the ability to shape this environment. But that power totes GREAT responsibility. We simply CAN NOT allow the technology to obliterate content; we can not have pretty dishes with nothing in them. My 5 year old is addicted to super heroes. From the moment his wee little noggin lifts from the pillow until he collapses in a heap into his bed, he is spinning webs, ironing his cape, or climbing into the General Lee (well, we use a rough definition of super hero around here). His two favorites (well, today - tomorrow it could switch back to Smokey and the Bandit or the Power Rangers) are Spider man and Superman. After watching Spidey for the 500000 time, I started to compile a comparative analysis in my weary brain. Hmmm....neither one had earthly mothers or fathers, both wore thick glasses, both were geeks, both worked at a newspaper, both had an arch rival, both feature American flags). What does this say about motherhood? What does it say about heroism? Gender? Yikes....I could go on and on and on. At the moment, I am getting my summer classes ready. I am not required to teach in the summer...I do it because I love it. I can feel the energy rising...summer classes are always good. This summer, I am trying something a little different...these course will be hybrid; they will be taught in real life and in Second Life. Seeing as my brain was already in compare/contrast mode from my super hero analysis, I started to think about what is the same - and what is different - about teaching in RL and in SL. SL allows me to host discussion groups - guided by lecture notes. Opening it up to the larger community will bring in all sorts of voices. Of course, it will also bring in griefers, and that is the beauty of the zapper tazer eject button. I can't wait to hear the voices (and, I must admit, it IS fun to use the eject button, too). I am sure that all of us have a busy summer ahead, but I hope that some of my fans will consider stopping in for one or two discussions. Who can pass up talking about the Puritans and their role as squelchers of Native American voice? Who can possibly pass up the opportunity to discuss the Christian and Pagan struggle for identity as seen in Beowulf? Ok, I admit it....I'm drooling.